I get lots of questions about some of the basics of iTunes. 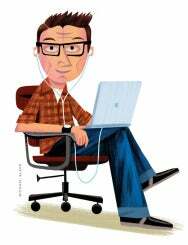 These are things that may not be that obvious, but are practical to know and can make your use of iTunes more efficient. Here’s a selection of some iTunes tips. Q: I can’t seem to figure out which of the many playlists is actually playing. They are all listed on the left but I see no indication of which one is playing. How can I find out? There’s no way in iTunes to see which playlist is playing. If you’ve started playing music in one playlist, then clicked something else, the playlist with the music won’t look any different. However, there’s a way to immediately jump to the current track that you’re listening to: just press Command-L. This will highlight the currently playing track, in the location where you started playing it. So if you started playing music in a playlist, the song will be highlighted there; if you started playing in your Music library, iTunes will highlight it there. Q: I like to put my entire iTunes music library (about 10,000 songs) on shuffle and listen to whatever comes up. But I don’t want the holiday genre (and occasionally other genres) included. How do I do this without constructing a 9700-song playlist omitting the 300-song holiday genre? 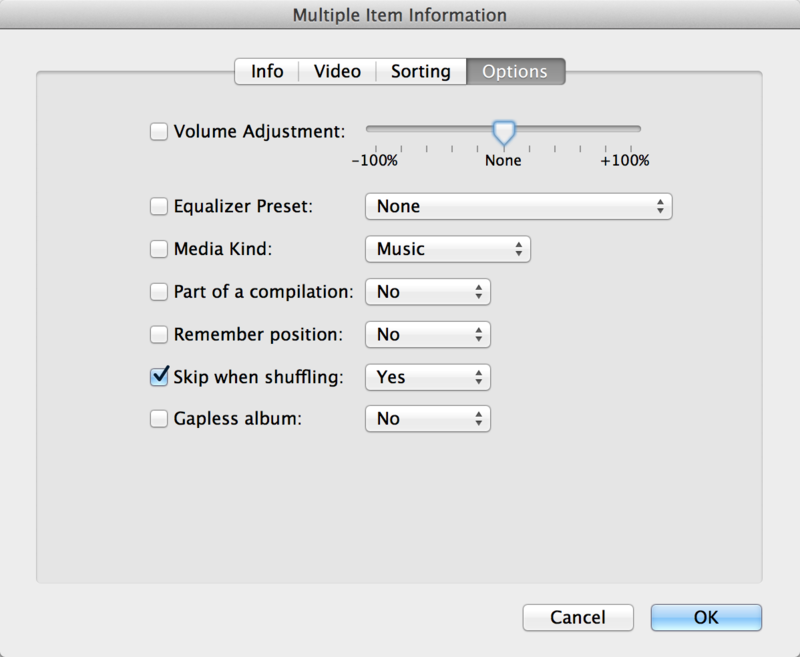 This option tells iTunes and iPods to exclude these tracks when you play in shuffle mode. 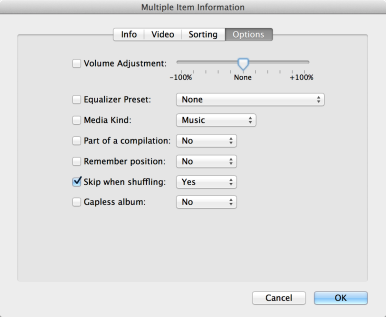 iTunes offers a setting to exclude tracks from shuffling. In this case, go to your Music library then display the Column Browser (press Command-B if it’s not visible). Click the genre you want to exclude from shuffle. (If you don’t see a Genre option, go to View -> Column Browser and select Genres to add that column.) Select all the tracks, then press Command-I to display the info window. Click the Options tab, then choose Yes from the pop-up menu next to the Skip When Shuffling option. Click OK and iTunes will prevent all of these songs from shuffling, both in iTunes and on any iPod or iOS device. You can do this for any genres you want to exclude from shuffling. If you ever want to change it back—say when it’s Christmas season—just select all the tracks and change that setting to No. Alternatively, you could create a smart playlist with music whose genre isn’t Holiday and use that as the basis of your shuffle. Q: I’ve ripped hundreds of CDs into iTunes and several of the albums have somehow been classified as compilations. Because of this, when I look under the artist listing I can’t find those artists. I have to know that they are in Compilations and look there. How do I get these albums to show up under the artists’ names? When iTunes gets tag information for a CD, sometimes that information has mistakenly set the infamous Compilation tag to Yes. You can change that. Select all the tracks you want to change, then press Command-I and click the Options tab of the info window. Next to Part Of A Compilation, select No from the pop-up menu and choose No, then click OK.
Is there a way to balance all of my songs in iTunes so when I shuffle them I don’t have to adjust the volume? In theory, yes, and it’s called Sound Check. To use it, go to iTunes -> Preferences and choose the Playback tab. Now check the Sound Check option. When you do so, iTunes will start analyzing all of your songs, and apply a positive or negative volume adjustment to them. When you play music back, these adjustments will be taken into account. iTunes displays Determining Audio Volume as it analyzes your music after you turn on Sound Check. This may take a few minutes if you have a large music library. But you should know that this feature is far from perfect. iTunes determines the average volume of a track, so a song that starts softly and ends loudly may still sound out of balance with the track before or after it. Q: My Purchased playlist recently changed to alphabetical order. I like to have the most recent purchases at the bottom of the playlist so I can easily see the most recent songs. How to do I get this back as it was before? You can sort any playlist by any of the columns that you see in iTunes. You probably clicked on the Name column header by accident. In the screen shot below, you can see that the first column header is highlighted in gray, meaning that it’s the current sort column. The triangle in it points upward, meaning that it sorts in order. In this case, this is the order that the songs were added to the playlist (which happens to be the album order). The column headers determine how iTunes sorts these songs. So, to get your Purchased playlist back as it was, you want to click on the column header above the numbers; if, when you do this, the triangle is pointing in the other direction, click again to reverse the sort order. You can do this for any column you wish. Note that there’s also a Date Added column that you can enable for any library or playlist (choose View -> View Options and put a check next to Date Added).